Semcac Clinic provides professional, safe, respectful care to transgender and gender non-conforming patients. All patients who access hormones at Semcac Clinic will also be provided community resource information as well as personalized referrals, if needed or requested. Semcac Clinic strives to reduce barriers to transgender and non-conforming persons and provide access to health care that is offered at a trans-affirming clinic. There are several options and a variety of types of hormones, we will help you find what works best for your body and your lifestyle. Many patients find that receiving hormones via Semcac Clinic is much more affordable than at other clinics. 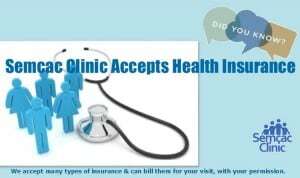 Semcac Clinic does work with several insurance providers, it is advised to contact them prior to your visit to determine what is covered by your particular plan. All patients will be asked to complete the following forms at the time of their visit: Medical History & Demographics. Please feel free to print and complete these 2 forms prior to your clinic appointment, if you are able. If you cannot print the forms ahead of your appointment, that is alright, we will provide them for you. Thank you. Learn more about the National Family Planning Program.